Sir Joshua Reynolds (Lugt 2364); John Barnard (Lugt 1420); Sir Thomas Lawrence (Lugt 2445); (Samuel Woodburn); Lord Francis Egerton, 1st Earl of Ellesmere (Lugt 2710b); (Thomas Agnew & Sons Ltd.); NGA purchase in 1973. The Ellesmere Collection of Old Master Drawings, The Museums and Art Gallery, Leicester, 1954, no. 93. NGA Recent Acquisitions 1974, no. 16. NGA Master Drawings 1978, p. 38. The Draftsman's Eye, Late Italian Renaissance Schools and Styles, The Cleveland Museum of Art, 1979 (catalogue published in 1981), pp. 18, 54, no. 62. Fürstenhöfe der Renaissance, Giulio Romano und die Klassische Tradition, Kunsthistorisches Museum, Vienna, 1989, pp. 136, 138, no. IV/12. Giulio Romano, Palazzo Te, Mantua, 1989, pp. 232, 346, 349. Giulio Romano: Master Designer, Bertha and Karl Leubsdorf Art Gallery of Hunter College, New York, 1999, pp. 17, 20, 24, 27, 34, 75, 76, 78, 82, 142, no. 19. "The Radiance of Apollo: the Italian Renaissance and Greece", National Gallery and Alexandros Soutzos Museum, Athens, 2003-2004, no. 155. Catalogue of the Ellesmere Collection of Drawings at Bridgewater House. London, 1898: no. 58. Bodmer, Heinrich. Lodovico Carracci. Burg bei Magdeburg, 1939: 150, no. 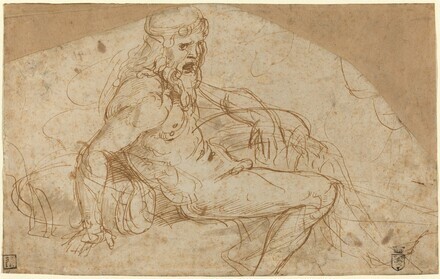 54 (as Ludovico Carracci). Hartt, Frederick. Giulio Romano. New Haven, 1958, 1: 140, 297, no. 176. Verheyen, Egon. The Palazzo del Te in Mantua, Images of Love and Politics. Baltimore and London, 1977: 118. Belluzzi, Amedeo. Palazzo Te a Mantova/The Palazzo Te in Mantua. Modena, 1998, 1: 385, fig. 237.